We’ve been working hard with Places for People for many years creating active play environments with water inflatables, land inflatables and adventure soft play areas. Working in partnership, we’re now about to launch our fourth soft play area, at Andover Leisure Centre. As with all of our soft play creations, we first spent time with the Places for People project team exploring the space, brainstorming ideas and developing a clear understanding of their aims. From this brief and working within the building’s design plans, we iteratively developed three dimensional visuals of the soft play area to collaborate over, arriving at an engaging solution within brief, on budget and delivered on time. Andover Leisure Centre is a brand new building with all new facilities and Places for People briefed us to create a fun, challenging and safe environment for 0-12 year olds. We work with Places for People to design soft play areas very much within their brand rather than our own, and have created a clean, open and fun space which people can identify as Places for People’s. 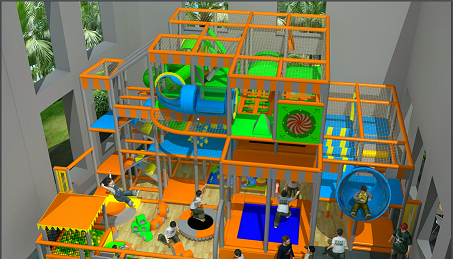 We’re preparing to move on to our next Places for Peoples active soft play installation at Loddon Valley near Reading. More to come soon.